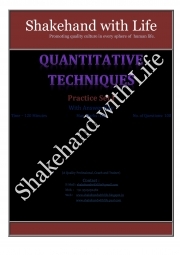 Description of "Quantitative Techniques 100 MCQ (eBook)"
Book is the collection of 100 Multiple choice Question of Quantitative techniques with answer key. Helpful for the students management and engineering for their practice on this subjects. Facts for You, July 2014 by EFY Enterprises Pvt. Ltd. Reviews of "Quantitative Techniques 100 MCQ (eBook)"